Dr. Frank Sapienza, dentist in Park Slope, offers beautiful and durable tooth replacement choices. Whether you have lost one, two or even all of your teeth, the Dental Spa of New York can span those smile gaps perfectly so you chew well, speak normally and look just great. Anyone who has smile gaps due to gum disease, accident, congenital absence of teeth, infection or decay should replace their missing teeth. Those gaps affect how you look, causing premature facial wrinkling and sagging and also bone recession. Also, teeth adjacent to a gap weaken and drift into the empty space. Teeth that were once well-aligned are suddenly poorly spaced and even crooked. 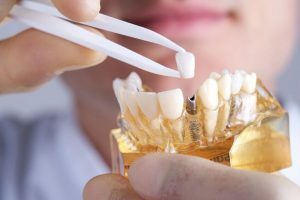 What are Your Best Tooth Replacement Options? Together, you and your Park Slope dentist, Dr. Frank Sapienza, can decide what prosthetic teeth are best for your oral health, function and appearance. The doctor looks at factors such as number of teeth lost, your age, gender, facial symmetry, overall oral health and jaw density and function. Here are the options offered at the Dental Spa of New York. Custom-made and precisely fitted, one of these choices is sure to be right for your smile. Crown and bridge This traditional prosthetic employs dental crowns, or caps, to support one, two or more artificial teeth in a row. The bridge itself is crafted from porcelain on metal or on lifelike and bright zirconia. Permanently cemented in place, the crown and bridge combination requires good flossing and brushing each day plus 6-month check-ups and cleanings with Dr. Sapienza. It’s lifespan is 10 years or more. Partial dentures A partial denture is much like a jigsaw puzzle piece: it fills one or more gaps spread out over the top or bottom arch. Made from durable acrylic and mounted on a metal frame, the artificial teeth are very lifelike and help the patient bite, chew and speak properly. This prosthetic is fully removable and held to neighboring teeth with metal clasps. Full dentures Conventional dentures replace entire arches of teeth. Both top and bottom dentures stay in the mouth via suction, and when well-fitted should need little or no denture adhesive. Made from tooth-and gum-colored acrylic, full dentures rest on the gums. The dentist places immediate full dentures right after extraction, necessitating relining or replacement at a later date. Conventional full dentures are placed after gum and bone have healed. Dental implants Sapienza partners with a local oral surgeon to place these modern and very effective tooth replacements. Made of a titanium screw which resides in the jaw, a metal abutment and a realistic porcelain crown, the dental implant looks natural and strengthens the jaw bone. Although there is substantial healing time required and a greater initial cost than traditional tooth replacement choices, the dental implant is exceptionally stable and attractive. It is also likely the last prosthetic the patient will need. It’s so important to your overall well-being. Why not investigate your replacement options with Dr. Sapienza? 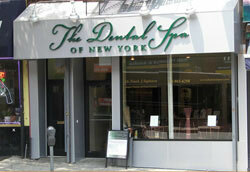 Contact the Dental Spa of New York today to schedule a restorative dentistry consultation.